​It had to happen. 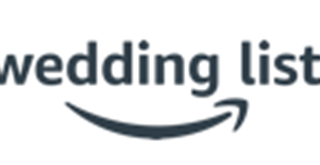 Now Amazon does Wedding Lists. For a company that is the Worlds largest undisputed retailer as measured by revenue and market capitalisation it often enters into a new product category like an elephant who sees a mouse. ​With well over 500 million products available to choose from, Yes I'll repeat that, 500 million products ! you can be certain that there'll be something that the couple will certainly find useful to have. ​This service is based in the UK meaning purchases will need to be delivered to an eligible address. A useful feature is the 'registry sugestion' which comes up when pressing the 'Browse the Wedding List Experience'. With fourteen of the most favourite categories right on top to get you into the Wedding feel. Create your Wedding List, then manage it from there as well as integrating with sellers at Amazon​. Ok, here’s a scenario that plays endlessly in your dreams the closer it gets to your wedding day; the cat runs up your wedding dress and tears it from top to bottom, as you run into the kitchen you collide with the cake supplier who drops your wedding cake all over the floor. On hearing your screams, the groom rushes in, slides in the dropped cake and breaks his arm on the slate floor. It may just be a nightmare for you, but for some couples disasters like these are very much a reality. So just what happens when something goes wrong? Of course you can’t plan for the weather or the health of guests vital to the ceremony, but with so much hanging on so many different wedding suppliers, are you courting disaster to think that it will all run smoothly? Just take a moment to think about all the arrangements that you will be making; the wedding cake supplier, the caterers, the photographer, the flowers, the dresses, the rings, wedding cars, reception booking, entertainment etc. The list goes on and there is nothing on that list that is not essential to your wedding. So what can you do should something go wrong? It isn’t unheard of for the wedding photos to come out blurred or not at all, as happened to Martin and Heidi Shubrook whose wedding album is full of shots of guests with their heads cut off, people’s feet and even complete strangers! There are also the risks of wedding venues being double booked, the dress or suit being damaged, wedding vehicle breakdowns, damage to wedding gifts and even some small firms going bankrupt, leaving you up the aisle without a bouquet, so to speak! Some couples think that insuring their wedding will provide them with the security of being able to be compensated at least in case things go wrong, but just how many wedding insurers pay out? And are you insured for all eventualities? In the example of Martin and Heidi above, you would have to pursue this through the courts at your own risk as the legal cover sometimes included with wedding insurance will only cover things like personal injury where the outcome is more predictable and will usually be covered by the trader’s own insurance. The quality of service offered by a supplier is a matter of opinion and not one a financial institution such as a insurance company will want to risk money on. Other common complaints for wedding insurance are the same with any insurance providers. Payouts can take months to be settled, by which time you are married and have had to stump up the extra costs yourselves. And of course what if your insurer disputes your claim? This couple were fortunate to get the media involved in their claim which led to a change of heart by their insurers – you will probably not be so lucky. Failure of wedding suppliers to provide their services – this could be caterers, florists, the photographer, the entertainment, etc. Wedding outfits. You may be insured for replacements in case either yourselves or the suppliers accidentally stain or ruin the outfits. Wedding rings. Just in case the Best Man loses the rings down the gutter, you’ll be insured for brand new ones. General liability such as damage to band equipment, injury or any accidental damage to property as a result of the wedding. What they won’t insure you for is cancellation due to the groom running off with the bridesmaid or the bride having a change of heart! So do make sure that you read the small print and find out how you go about claiming, how long it takes and just what you will be insured for. The level of cover will vary from insurer to insure but, as a guide, this policy document from John Lewis sets out what you can expect. 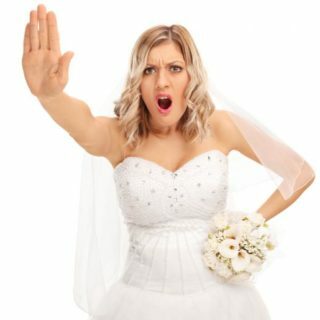 How else can I resolve issues with wedding suppliers? Well should anything go wrong you can try to resolve the issues yourselves. For instance, if the caterers serve up the wrong menu, you could try talking to them and asking for a partial refund. Many issues can be resolved by simple communication with both parties willing to compromise. If that doesn’t solve the issue then you could approach a third party to help with your dispute. Mediation – Consumers normally need to pay for a mediator which may be more than the refund and/or compensation you are seeking, but you can get a low cost mediator from the government funded National Mediation Helpline. Arbitration – An arbitrator will speak to both parties and make an independent judgement based on written and other forms of evidence. The decision is legally binding for both parties, so you must be aware that if you don’t like the outcome, you cannot challenge it. However it also means that you make an arbitration award legally binding for the supplier. But once again, this can be an expensive option. ADRnow explains the arbitration process. Small claims – If you take your case to a small claims court you will automatically be offered mediation which is covered by your small claims fee. If you win your court case, such as Heidi and Martin then you are awarded not only compensation but your court fees too. However beware of small companies going bust such as with Heidi and Martin Shubrook, as you may not get the full amount awarded to you and may need to pay a fee to get the court order enforced. More information about taking a wedding supplier to the small claims court can be found on the CAB website. 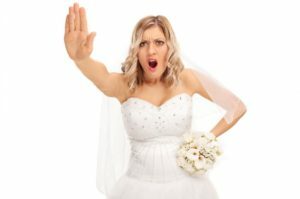 The best way to deal with wedding supplier nightmares is to avoid having them in the first place! Make sure that your wedding supplier has a good track record. Ask to see their portfolio and customer comments, check how long they’ve been trading and find out if your local Trading Standards office have heard of them. A little time spent on research can prevent a lot of heartache and cost afterwards so do ensure that your wedding suppliers are top notch before paying for their services. Also, there is a reason why more people choose to pay by credit card other than the monthly repayments; Section 75 of the Consumer Credit Act make the card company jointly liable for a bad service from traders. Providing your claim is more then £100 and less than £30,000 you can hold the credit card company equally liable. Just write a letter to the supplier detailing your complaint and send a copy with a separate letter to your credit card company giving both a deadline to act. More information about credit card liability is on the Consumer Direct website. Remember though, if you pay by debit card you are not entitled to this protection. With any luck all you’ll need to worry about on the big day is whether or not your left foot will get in the way of your dancing! Consumer Advice Guide – a useful guide from the Citizen’s Advice Bureau on consumer issues. Do you have your heart set on a designer wedding gown from Alfred Angelo, Maggie Sottero, or Mori Lee but are put off by the cost? Many UK brides are cottoning on to the fact that massive savings can be made by buying their wedding gown and bridesmaids outfits in the US. Is it a Good Idea? Brides-to-be who want the latest Designer Wedding Gown are now taking advantage of the favourable exchange rate and buying their dress from US retailers such as House of Brides and Best Bridal Prices. The wedding market in the US is much more dynamic than it is here. Wedding dress retailers are well established on the net and they have massive economies of scale that retailers in the UK just can’t match. This alone is reason enough for dresses in the USA being better value, but when you factor in the exchange rate – they become even more of a bargain. As an illustration: a Mori Lee Dress (2164) retails on US site Best Bridal Prices for $600 – which at today’s exchange rate is just short of £300. An ‘authorised’ Mori Lee retailer in the UK, however, quoted me £750. This is not an isolated example, it tends to be fairly typical. Bear in mind that you will have to add on Shipping, VAT and Import Duty, which is payable on delivery. VAT is charged at the normal rate (and includes the shipping cost as well). Import Duty is payable on the value of the dress too; the rate depends on the description and type of fabric but is generally 12%. When your dress arrives in the UK you will receive a note from the courier to inform you that your dress is about to be delivered and the amount of duty you will have to pay. The courier will have already paid the relevant duty and will recover it from you at the time of delivery. In order to protect their traditional markets, some designers, most notably Maggie Sottero, have forbidden their retailers in the US from selling to overseas customers. However, it’s not difficult to find suppliers who are willing to bend the rules? The Office of Fair Trading say that a customer buying from a UK based internet retailer has greater legal protection than if they bought from a traditional shop. However, when you buy outside the borders of the UK and Europe your level of protection is not so clear. Many people worry that there is a much greater chance of being ripped-off and if things do wrong then there is less legal protection than in the UK? To an extent this is true, but, in reality, instances of complaints against US retailers are quite low, and often these get resolved by contacting the retailer directly – rather than by any authorities’ intervention. Take care with sizing – most retailers have a sizing chart or conversion tool on their site, but if you have any doubts ask them. If unsure you should opt for the larger size, as it’s easier to take a dress in than it is to let one out. The biggest source of all complaints is delivery although OFT data suggests that the number of difficulties does not appear unusual when compared to other distance selling channels, and that the types of complaints match those for traditional mail order. US suppliers will offer you insurance cover for shipping problems – in the UK this would be unlawful but, given the complexities involved, it’s probably worth paying the premium just for peace of mind. If you buy from an individual you have little legal protection, although when buying from a ‘professional’ seller your rights are the same as with any other merchant. Bear in mind though that your claim will be against the merchant and not the auction website. If at all possible, pay by credit card. If you have a problem then Section 75 of the Consumer Credit Act 1974* means that the card provider is equally liable for purchases between £100 and £30,000. If you use PayPal your protection will be limited. They are not providing you with credit so are not liable, although they will certainly offer advice and assistance. Use retailers and services you know about – or ones that have been personally recommended to you. Once you’ve ordered your dress in the US, you only have 3 days to change your mind and cancel (in the UK you have 7 days). Allow yourself plenty of time – if there is a hitch, it could take a while to resolve so don’t risk a ‘just-in-time’ delivery date! Make sure you know the trader’s full address and contact details. Don’t assume a company with a ‘.co.uk’ domain is actually based in the UK or that a ‘.com’ domain is based in the USA! Know exactly what you’re buying. Branded items with ‘too-good-to-be-true’ prices could be counterfeits. Take into account the shipping, postage and packing costs as well as VAT and Import Duty. Look for websites that have a secure way of paying – these show a padlock at the bottom of the screen when you are filling in the payment details. Keep a paper trail. Print and save records of your online transactions, including the product description and price, the online receipt, and copies of every email you send or receive from the seller. If you have followed the advice then you shouldn’t have a problem – but if the worst comes to the worst what can you do? * Contact the retailer directly, in the first instance. Most problems are resolved this way. If you have purchased goods from an American company then you could contact the Federal Trade Commission (www.ftc.gov) or the branch of the Better Business Bureau local to the trader (http://lookup.bbb.org) A complaint about an overseas internet business can be registered at www.econsumer.gov, an international consumer complaint database maintained by the US Federal Trade Commission. The site also provides general information about consumer protection in all participating countries and contact information for consumer protection bodies in those countries. If your chosen dress is less then £300 in the UK then no. Also, if you are not blessed with being a fairly standard size then the cost of alterations could well outweigh any potential savings. However, if you are spending more than this, or, perhaps, buying your bridesmaid’s dresses at the same time then you could well save a substantial amount of cash and should definitely go for it!